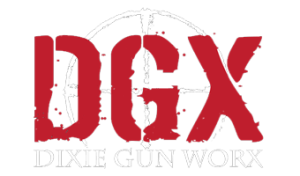 Dixie GunworX (DGX) specializes in custom builds for AR platform tactical/sporting rifles as well as hunting and long-range competition rifles. Unlike any other company, DGX uses the best manufacturers in the industry and the highest quality materials in order to customize each AR15 according to your specifications. For the price that you would spend on a basic model firearm at a sporting goods store, you can create a top of the line product at DGX that you will have no need to upgrade in the future. Here at DGX, we understand that each component is vital in its contribution to the overall performance and lifespan of the firearm. We are dedicated to finding and using premium components to produce each AR15, making our finished product noticeably superior in quality and function. When you choose to own a custom DGX AR/M4, you choose to own a firearm that is both durable and dependable. Your firearm will cycle smoother, will have less recoil, require less lubricant, and most importantly, will shoot more accurately, guaranteed. Let us help you get your dream AR built at DGX today!